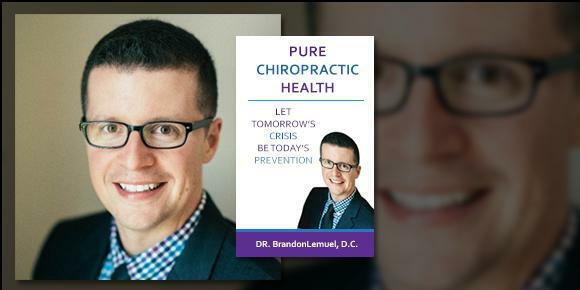 Dr. Brandon Lemuel, DC, has a new book, “Pure Chiropractic Health: Let Tomorrow’s Crisis Be Today’s Prevention,” which recently hit the charts in categories Alternative & Holistic, Chiropractic, Pain Management, Physician and Patient Diagnosis, Physical Impairments and Alternative Medicine, and Health Risk Assessment. He boldly wrote his new book, “Pure Chiropractic Health: Let Tomorrow’s Crisis Be Today’s Prevention,” to share his message with the world so more people can find real and lasting health.column, and Dr. Lemuel determines the root of the pain and create a personalized chiropractic and wellness plan to suit each patient’s individual needs. Under his care, patients report higher functioning in all areas of their lives. Dr. Lemuel has become a sought out speaker, speaking on health and wellness, proper ergonomics, stress management, and peak performance in life and leadership. He has spoken at places such as Capitol Hill, FBI, Freddie Mac, University of Bridgeport, Cleveland Chiropractic College, CGI, D’Youville College, PNC Bank and at groups and associations all over Northern Virginia. Dr. Lemuel graduated from Palmer College of Chiropractic as one of the top three student doctors, top three philosophers, and among the top .06% in leadership. Since graduation Dr. Lemuel has become committed to being the best doctor he can possibly be. He has gained additional certifications for several Chiropractic techniques, nutrition, wellness, pediatrics and extremity care. Dr. Lemuel is currently enrolled in the Certified Chiropractic Wellness Practitioner program. There are only 100 doctors worldwide with these credentials focusing on coaching people to live healthy lifestyles.